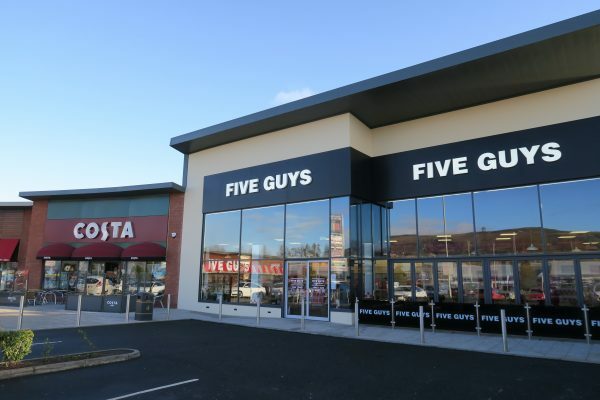 Five Guys have opened their third store in Northern Ireland at Boucher Square, Belfast, this compliments their existing units at Victoria Square, Belfast and Rushmere SC, Craigavon. The unit let by TDK is located in the successful Boucher Square which is home to several national food and beverage operators including Costa Coffee, Frankie and Benny’s, Nandos and Eddie Rockets. With Boucher Retail Park situated directly opposite the scheme the area has become Northern Ireland’s premier one-stop leisure and hospitality destination providing all the shops and eateries you need for a day out. A sixth unit is currently under construction, it is due for completion early 2019 and we are sure it won’t take long before we are welcoming another new name to Boucher Square.